Lock & Rotate your iPad. Lock the iPad to the bracket with your key. With our new BOSSCOM Rotate Wall Bracket it is now possible to mount your iPad on the wall. By using a key you can lock the iPad to the wall bracket so that no one can steal the iPad. The iPad can rotate lef/right and up/down. 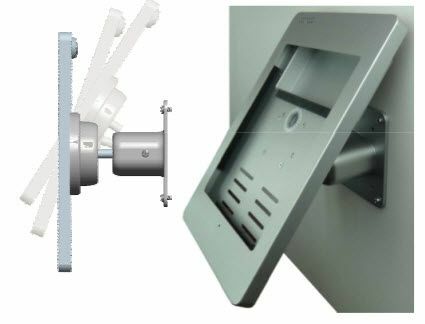 If you do not have the possibility to connect a 110/230V iPad adapter to the iPad then it has a possibility to connect a batteri patter bank by ordering the iPad Rotate Wall Bracket with power bank.